Arrgh, This one hurts. There goes my street cred. Call the scene police. Forgive me Jello for I have Sinned. As much as this column is a portal into the things that made me a punk it is also as you may have picked up on by now a confessional of some decidedly un-Punk moments but those are really the important ones aren’t they? So what is my big transgression this time? I sang out loud to a Journey song-in a bar. And damn it I will do it again. And so would a lot of you out there and guess what there’s nothing wrong with that. 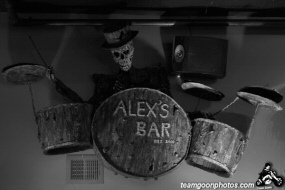 The incident in question took place a few years ago at one of my favorite haunts, Alex’s Bar in Long Beach. Now Alex’s is a dyed in wool Punk rock dive with a portrait of Johnny Cash hanging over the bar and dia de los muertos artwork scattered throughout. This makes my alleged crime akin to wearing a Giants cap to Dodger stadium or maybe drawing a mustache on the Mona Lisa or ordering a Michelob Ultra- you just don’t do it. So any way it was a sweltering summer night and my buddy Mike A. and I had decided to go over to Alex’s for a pint or three and talk music, we were in band together(but that’s another column-see that’s called foreshadowing folks) and generally just be slacker degenerates. So a couple of drinks into the evening it happened. The jukebox started up and the familiar sounds of Don’t Stop Believin’ started pulsing out of the speaker. We had no choice we had to do it, maybe it was the booze or maybe just maybe we really liked that infernal tune. That’s right we stood up and started belting out the chorus at the top of our lungs and we didn’t care who was looking at us and what they were thinking. Because in the midst of our revelry two girls at the table next to us started snickering at us in their attempt to shame us and brand us as less than cool, objects of scorn and ridicule for the musical elite that we had betrayed by our outrageous display. How dare we taint the sanctity of this establishment with our unabashed enjoyment of Journey. The only possible course of action was to leave as quickly as possible and never show our faces there again, right? Wrong. Instead I took a long pull of my beer gently set it down on our table, walked over to our mockers and proceeded to inform them that A. the song was in the jukebox so obviously a lot of other people including the owner probably liked that song B. Somebody else in the bar had to have requested it and C. get over yourself and admit that you like the damn song and just have a good time. Maybe they were too shocked or maybe they knew that I was right and they were the ones who had indeed sent the their hard earned dollar on that selection but my tormentors were left speechless and I triumphantly returned to my table and sank into my chair and enjoyed the refreshing taste of victory and the rest of my beer. Sometimes in our pursuit of coolness, in our rush to go against normal conventions we get a bit full of ourselves and don’t allow ourselves to admit we like certain types of music because they might lower our hip quotient or put a dent in our status as anti-establishment crusaders. I myself am as guilty as anybody of often being a music snob and many a time have I publicly and quite mercilessly assailed peoples choices in song. Because really there is a lot of crap out there and certain things just deserve to be reviled-Im looking at you Michael Bolton, Limp Bizkit. But by the same token there are somethings that are just meant to be enjoyed because they are good songs that make us feel good and I don't mean in some ironic hipster oohh look at my sweet members only jacket kind of way. I mean liking something because you have always like it and everyone else be damned. Now it could have something to do with the popularity of Glee that it is safe to listen to Journey and crank out Don’t Stop Believin’ without fear of reprisal and embarrassment. It’s not bad or cheesy if its on a hit TV show right? But for me that song just takes me back to being a kid pure and simple-there is no irony or even bandwagon jumping attached to it. I’m thirty five and a married father of two I’m not afraid of the cool police anymore. Oh and one more thing that’s right I watch Glee- a show about a bunch of freaks and outcasts who use music to get over on the cool kids, hmm why does that sound so familiar?